With the approach of autumn, my life has once again taken some amazing new turns. Those who follow me on social media know that I finished my BA in English this year, and was accepted into an MFA program. I just finished my first 10-day residency and met the most amazing group of people, and made so many new friends. I am almost done with the major revision of Nova Wave and have almost got all of the Weathered Collection stitched together. I am scheduling both of those for release in October. Probably Halloween. One of the things I am learning in the MFA program is how to edit and produce a literary magazine. I am so stoked about this, and as a bonus, I get to help a friend with a contest he is running in the magazine he edits. This all comes on the heels of starting the YouTube channel for Twisted Candle Media. Little by little, things are coming together. The shows that I want to produce for TCM are called “Wild About Oklahoma” and “Chasing The Muses”. “Wild About Oklahoma” will feature Oklahoma’s great nature spots, flora and fauna, and perhaps events as well. 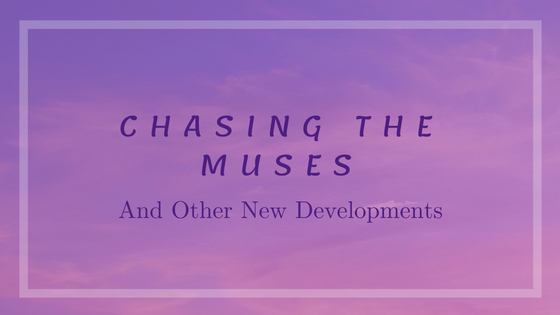 “Chasing The Muses” will be about creativity, specifically, rekindling and nurturing that creative spark we all possess. While most of this will be geared toward writers, the concepts are applicable to a variety of creative pursuits. In order to help promote these, I will also be featuring blog posts on the Twisted Candle Media website. I also feel that these will be run in regular seasons, like television shows. “Wild About Oklahoma” will likely be filmed in Spring and Fall, and “Chasing The Muses” will likely be shot in the Summer and winter. In this way, I hope to both maintain a consistency and provide variety for my viewers and myself. Variety is one of those things that I believe is vital to the creative spirit. Well, I think that’s just about got us caught up for now. Don’t forget to sign up for the newsletter, and go check out Twisted Candle Media on YouTube. I already have a trailer up for “Wild About Oklahoma” and have been working on the first few episodes of that as well as an intro video. Look for updates on the TCM website or on social. Next PostWe’re going to Steam Con!